Although we hardly notice it, the Internet is changing our lives. It is hard to think of a daily activity in which the Internet is not present or even of a task that was easier to do before it existed. 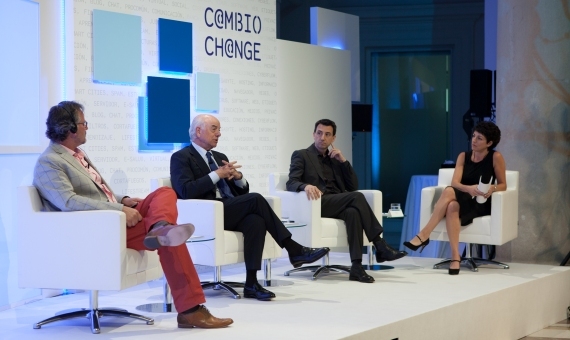 That’s one of the conclusions that can be drawn from the book “Ch@nge: 19 Key Essays On How The Internet Is Changing Our Lives”, which was presented yesterday in Madrid by Francisco González, President of BBVA, and two of the authors of the book, Federico Casalegno and Lucien Engelen. The Internet “crucially affects all human activities, in all spheres of our life, whether we are aware of it or not,” González reminded the audience during the presentation. The book, published by BBVA Openmind, collects the reflections of influential authors in the fields of communication, technology, medicine, economics and many other areas that, in one way or another, have been transformed since the arrival of the Internet. “The Internet is the greatest agent of change nowadays and, by its very nature, is free and difficult to control,” highlighted Gonzalez, who has explored the threats and opportunities that the Internet poses to the banking business. The sector faces the arrival of a new generation of customers who were “born with the Internet” and who have possibly never set foot inside a bank. It must also expand its services so that “the two billion people who are outside the financial system due to their low income in emerging countries can access it,” said Gonzalez. And yet the biggest changes are still to come. More than a third of the world’s population is already connected to the Internet and the connection rates in developing countries are increasing rapidly, especially via mobile phones. One can only expect to see even more profound changes as these countries begin to transform the technology to fit their reality. “The revolution we have seen with the Internet is nothing compared to what will happen in the next 10 years,” says Federico Casalegno, one of the 19 authors who participated in Change and attended the book presentation in Madrid at the headquarters of the BBVA Foundation. Casalegno is the Director of the MIT Mobile Experience Lab at the Massachusetts Institute of Technology, where he explores “how to construct the Internet around the needs of people and not vice versa” to avoid the possible isolation of the real world. In the future, which is more and more present every day, there will probably be a fusion between technology and the body. The next frontier is printable tattoos that measure our vital signs or pills containing sensors for the improved monitoring of medication,” said Casalegno. However, another well thought out perspective holds that the Internet, social networking and all that surrounds them are, in fact, the real world. So believes Lucien Engelen, Director of my REshape Innovation Center at Radboudumc (Netherlands), another author of Change who participated in today’s presentation. “The boundary between the online and offline world is disappearing,” says Engelen, using a new term to define the current reality: “onlife”. Engelen explores how new technologies can improve health and health care. “As I speak,” he said today, “there is a colleague of mine in Holland who is monitoring my vital signs.” This is done thanks to a sensor that attaches to the chest and sends data on respiration or heart rate via the Internet and which can be consulted with a simple mobile application. According to Engelen, the future in this area is not the technology, but rather the patients themselves. “Patients are experts on their diseases and are a huge source of information for physicians,” said Engelen, who has created platforms like Here is my data, where patients can share data from their medical records and obtain advice from health professionals. One of the areas most affected by the Internet is banking, which must modernize and adapt itself to the new ways of doing things that the Internet requires. In fact, the new competition for banks may arise from large technology companies like Google, Amazon, Facebook or some other still unknown entity, suggested Gonzalez. The President of BBVA has shown himself to be hopeful because he believes that banks have an advantage over other competitors: the large volume of information they have about their customers. “The challenge is to convert this data into information, and this, in turn, into knowledge in order to offer customers what they want, when and how they want it,” he highlighted. It is the foundation of the challenge that lies ahead for BBVA, converting itself into a new bank of knowledge. Do You Already Know What the Latest OpenMind Book is About? Are You Ready for Ch@nge?